This KitchenCraft coaster is made from hard wearing and durable ceramic and features an intricate blue tile design. The ceramic top of the coaster has an anti-scratch and anti-stain coasting and the back of the coaster is cork backed which provides protection from hot cups and mugs on your table eliminating damage to the surface. 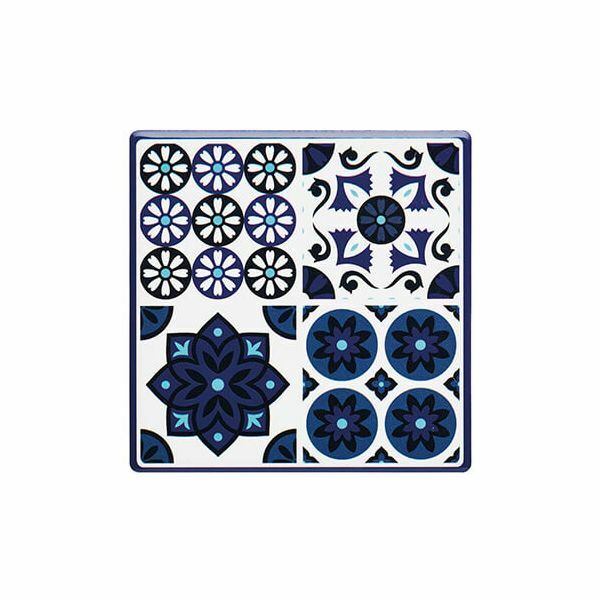 Ideal for mixing and matching this decorative blue tile coaster is great as giving as a gift to friends and family. Your delivery when and where you want it!, DPD convenient one hour delivery window notified on the morning of your delivery, choose your preferred delivery day up two weeks in advance via our integrated check out, (Saturday, Sunday & AM deliveries charge extra), or choose to have your parcel delivered to your nearest DPD click & collect Pick Up Point. If you are normally at work during the daytime, it is advisable to either have your order sent to your place of work or to a neighbour or friend who can sign the receipt for you. Alternatively, during the checkout process you are able to advise us of a safe place your order can be left. We Pride ourselves on our rapid service and aim to have your order picked, packed and delivered within 1 working day via DPD Courier for orders placed on a week day before midday or 3-7 working days via Royal Mail. We will inform you if there may be a delay; please inform us if this level of service is not upheld. Confirmation of receipt and acknowledgement of your Order will be sent to you by Email. Please note for orders being delivered to a separate delivery address than the card holders registered address, there may be a 24 hour delay for further security checks. Upon receipt of the purchases we will give you a full refund of the amount paid or an exchange credit as required. Any purchases that have been used or are not in a resaleable condition, or are not returned including original packaging will not be refunded. The costs of returning unwanted purchases to us shall be borne by you. Please return unwanted purchases to the address below including a note of your order number and the reasons for return. Alternatively the parcel can be returned through the Collect+ network, at a charge of £3.50. Please phone and we can email a returns label. The parcel must be under 10kg, valued at under £150, and can be dropped off at any one of over 5500 collection points across the UK, at a time to suit you. For larger or more valuable items, a collection via our courier at a charge of £10.00 can be arranged. This service operates within working hours on week days from any UK mainland address. Please call 0800 371 355 or e-mail sales@hartsofstur.com if you wish to use the Collect+ returns service or book a collection. To receive the latest offers, new recipes and more!